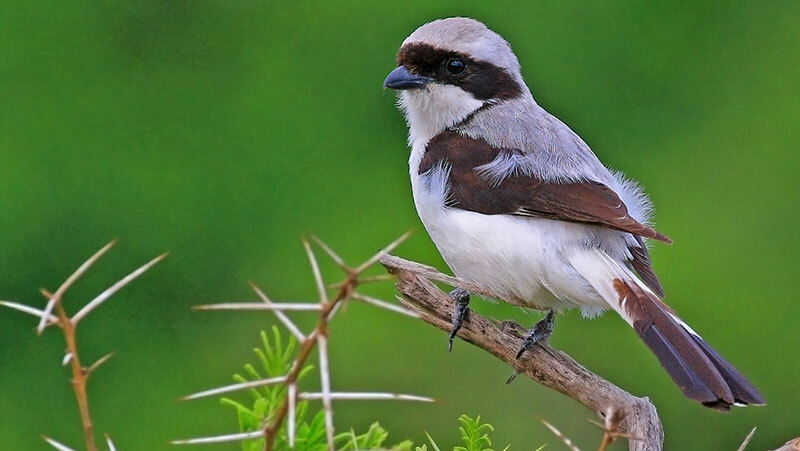 Most readers will be familiar with the Common Fiscal (aka Butcherbird, Jacky Hangman, Laksman, Kanariebyter), that medium-sized black and white bird usually seen sitting in a prominent position on a pole or telephone wire, often making a lot of noise. You might even know that its nicknames derive from its tendency to impale its larger prey on thorns or barbed wire. Retired geologist Colin Ralston has been documenting the wildlife of the George Botanical Gardens for some years. Among his many interesting discoveries (not least of which was a ground beetle larvae which preys on Painted Reed Frogs, a first in South Africa) is the range of items cached on the razor-wire fencing by the resident Fiscals. Colin has catalogued the prey items on iNaturalist in the project “Larders and Caches” and it is truly astounding to run your eye over the various beasts which have suffered this gory ending. These include beetles, crickets, cockroaches, bees, gecko, mantids, bugs, caterpillars, worms, millipedes, slugeaters (small snakes), a crab, a shrew, a couple of rodents, chameleons, frogs (including black rain frogs which I can never find) and even birds (Cape Robin-chat and Cape Weaver and some too disfigured to name). Colin reports that sometimes the bird returns to eat the prey but quite often the item is never eaten. There doesn’t appear to be a prey preference, the birds seem to be catching whatever is available in surplus. Colin has seen the Fiscals, true to their nickname, hang up the larger-bodied animals (rodents, snakes, etc) in order to help with the butchering process. One mouse was ripped apart and fed to chicks on the nest within four minutes. Nico Myburgh, in an article in “Village Life” describes stopping to watch a Fiscal he thought was beating up a snake in the Helderberg Reserve. When the bird left with nothing in its bill, Nico went to investigate and found that the Fiscal had killed a 10-day old Thick-knee chick. It’s little wonder they are thought of as the smallest raptor.